PenaShield is a Termiticide, Fungicide and a Perservative. It is a borate based, ready to use wood preserver that will kill and prevent carpenter ants, drywood and subterranean termites, wood boring beetles and decaying fungi. It is easy to use - just brush or spray onto the wood. For exterior use, paint or seal wood after applying. All termites that have been sprayed directly or have ingested the wood will begin to die. It could take a few days before the whole infestation is eliminated, but they will slowly all die. When using as a termiticide, it is not a substitute for mechanical alteration, foundation treatment or soil treatment - if there are active infestations, get a professional inspection. After applying to wood, do not expose to snow or rain for at least 24 hours after treatment. When added to surfaces that are exterior, make sure to cover grasses and plants with plastic to avoid affecting regular plant growth. Apply only to bare, dry wood. Remove any finishes or water repellents before applying PenaShield. Clean surfaces to be treated to ensure they are free of dirt and other contaminants. If the finished appearance is a primary concern, also remove mold and mildew prior to application of PenaShield. If detergents or cleaners are used to prepare the surface, thoroughly rinse and allow surface to dry prior to application of PenaShield. Apply PenaShield every 1 to 5 years to exterior unfinished bare wood surfaces. Interior surface treatments of existing wood are considered permanent and do not require reapplication or coating except in situations involving repeated moisture contact or high humidity, such as shower stalls, bathhouses, saunas, etc. Any additional installed wood must be treated. Protection may be extended by coating/painting treated wood with a water-resistant finish such as paint or exterior stain. Although a wide variety of paints and stains have been successfully used over PenaShield treated wood, it is always a good idea to coat a small section of treated wood with the finish to be used and check for compatibility prior to complete application. 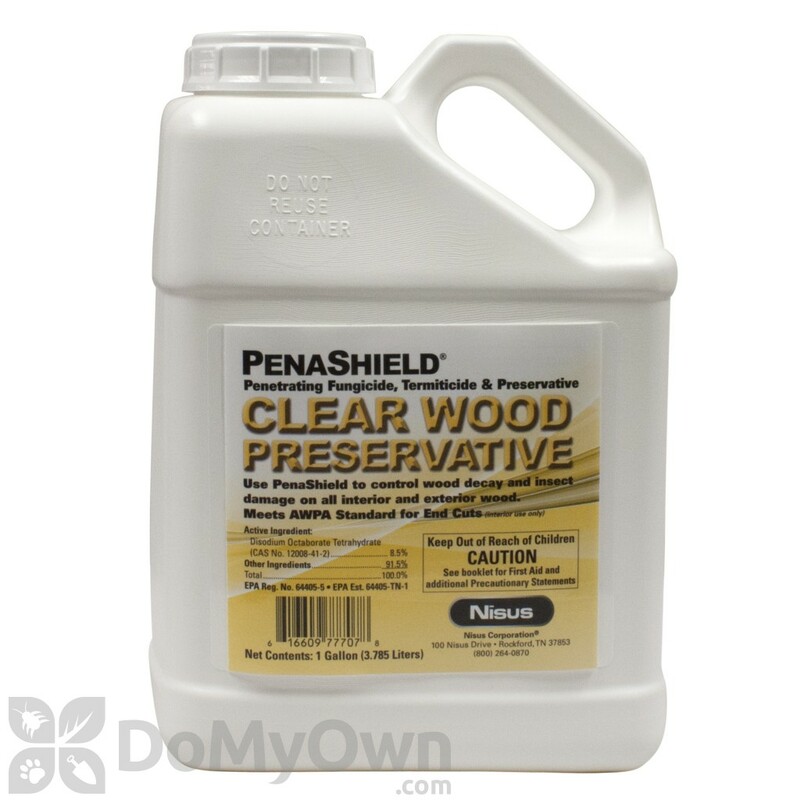 Allow PenaShield-treated wood to completely dry (at least 24 hours) before applying any protective finish and apply protective finish within 2 weeks of treatment. Apply PenaShield only to bare wood or to wood surfaces where an intact water-repellent barrier is not present. PenaShield is a ready-to-use product. Either brushapply directly from the container or apply with a low pressure garden-type sprayer. Small wooden items may also be treated by dipping. Return unused product to original container and seal tightly. Always clean and/or flush equipment and lines with water after use. When applying more than one coat, wait at least 20 minutes between applications. No immersion or dip soaking necessary. See product label for specific directions according to specific treatment. How does Boracare compare to Penashield? My understanding is that Penashield is basically like Boracare but pre-mixed. Is it as effective as Boracare for drywood termites? The reason why I'm asking is because I sprayed Penashield on some ants and after they floated around for some time they casually walked away like nothing happened. If Boracare is suppose to kill on contact why doesn't Penashield do the same? Thanks! Neither Boracare no Penashield kills on contact. These products are stop feed products and after consumed can take several days to a could of weeks to kill ants. Easy website, good info, very large selection, good prices. Excellent chat function with folks who know what they are talking about. Got all my questions about the product answered, quick order process, very fast delivery. Happy repeat customer. What's the difference between Penashield & BoraCare? Especially since Boracare is diluted? Is this 'already diluted' Boracare? Penashield and Boracare do have the same active ingredient. However, Penashield should be used every 1-5 years while Boracare lasts for the life of the wood in favorable conditions. We would recommend using Boracare if you are seeking a longer lasting treatment. What store can you buy PenaShield in locally? We apologize but most of the products we carry are professional grade and are not sold in any local stores. We do offer FREE shipping on all our orders though so we would be happy to ship the product to you. Will PenaShield work for powderpost beetles and can I buy it in NYC? 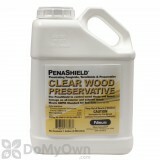 PenaShield is labeled to eradicate wood boring beetles. We are unaware of any locations in NYC that you can purchase the product, please contact Nisus for more information on treatment etc. They can be reached at 800.264.0870. What is the called for dilution of PenaShield or is used straight from the bottle? Is this used straight from the bottle or diluted. My use is for powderpost beetles. PenaShield is meant to be applied undiluted directly from the container. Is it harmful to kids or animals? PenaShield is safe around animals and children if it is used as directed. We would not recommend using it when animals and children are in the room. Once the product is dry, it is safe for children and animals to return to the area.